The moment we’ve all been waiting for has arrived – at least, if you are a small child who seldom is allowed unrestricted access to a table of candy, it has. Our base gingerbread house is solid. We’ve assembled our decorations and mixed together the icing. 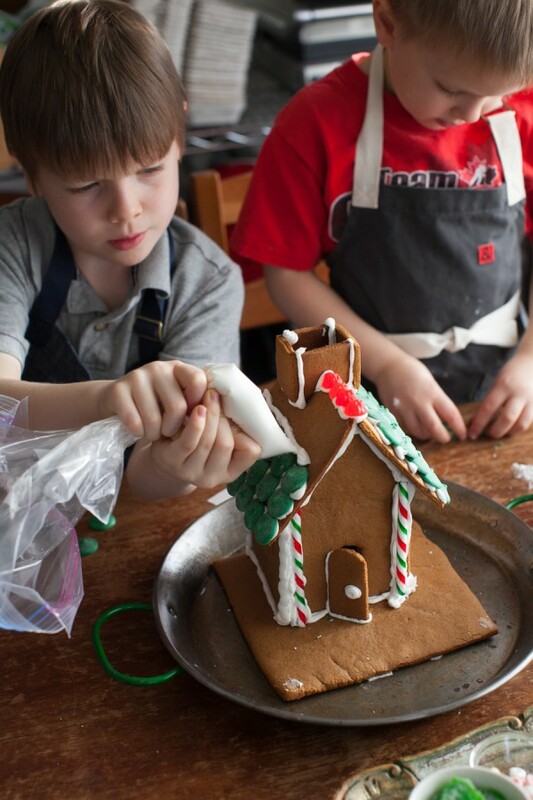 This is the part of the after school gingerbread project where we can leave the recipe aside and get creative. 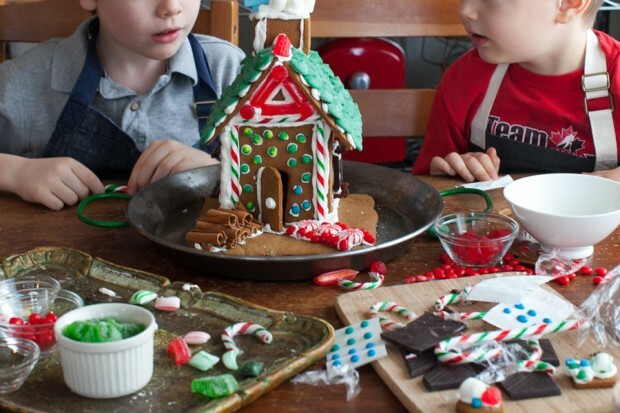 It’s time to use our imaginations to decorate a gingerbread house that is pure holiday magic. You’ll need another Ziplock bag with royal icing and one corner snipped, for applying the ‘glue’ to the house and your collection of candy for decorating. Mateo’s tip: A warm cloth for sticky fingers is a good idea! Start anywhere you like. We added the chimney, a row of jujubes along the ridgepole of the house, and the front door. 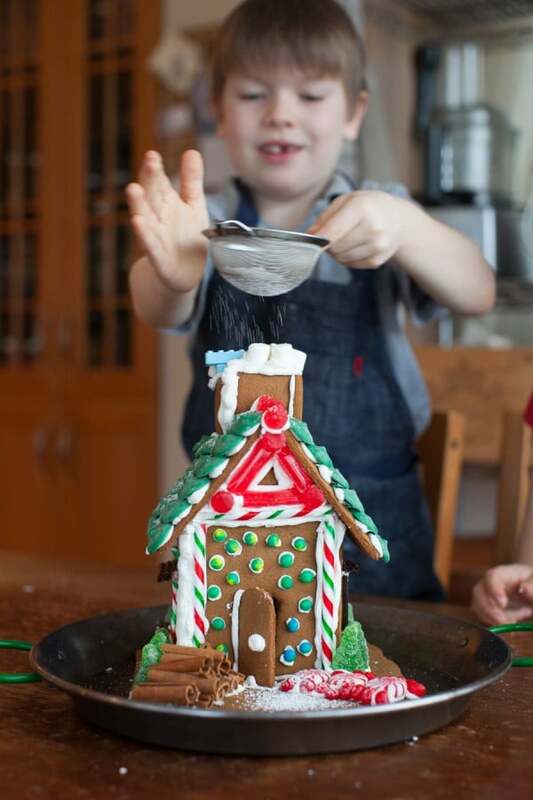 Noah worked the royal icing once again, and Mateo laid Wilton dark green candy melts in rows for roofing tiles. The boys look serious, but there was plenty of goofing off, believe me. Tomorrow I’ll post a handful of photo outtakes from the entire series. Such silliness. And the table got a little sticky, but that is okay. Working or playing? Looks like fun to me. Noah’s tip: Dust a little powdered sugar over the top to look like freshly fallen snow. Our finished gingerbread house. The window is a square of chocolate. 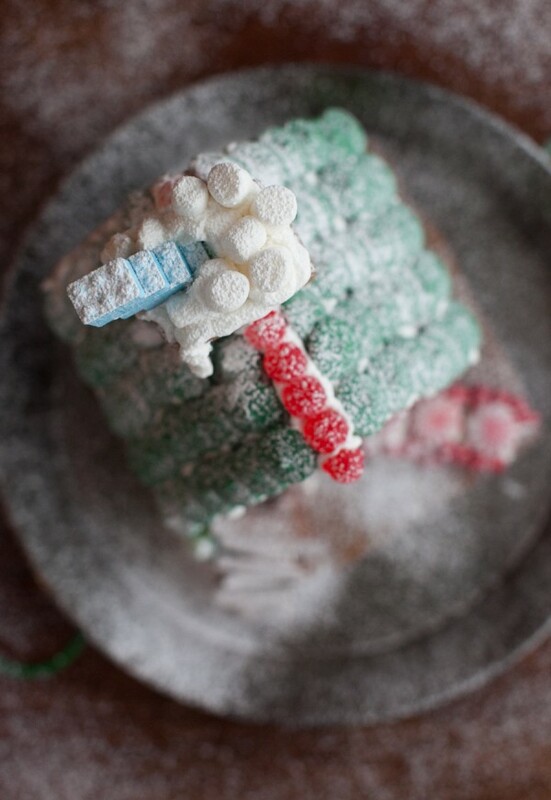 The chimney is full of mini marshmallows and pale blue Lego candy ‘smoke’. Isn’t it adorable? Mateo designed and built the pathway. He also added the broken cinnamon sticks for a woodpile. 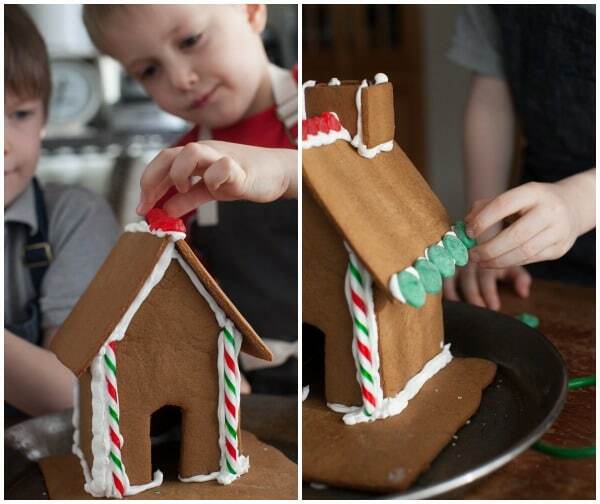 Of course you can decorate your gingerbread house any way you like – that is the best part about making one from scratch! 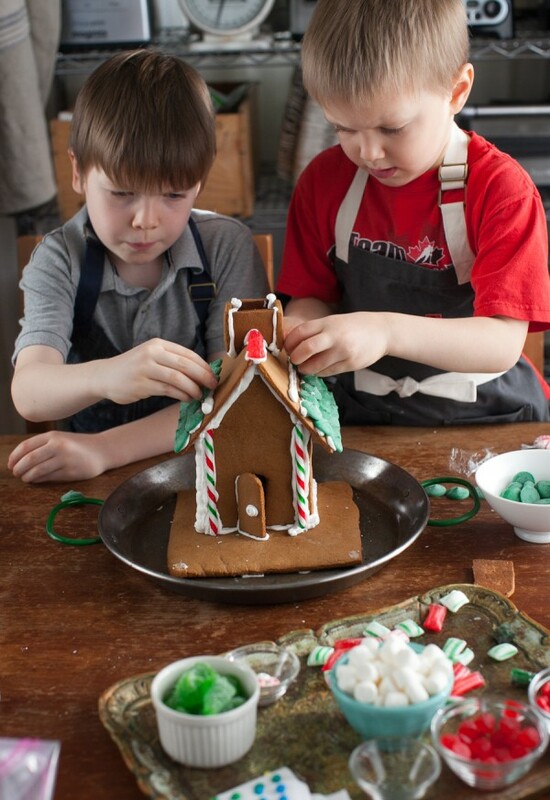 I hope the boys and I have inspired you to roll some dough and create a gingerbread house of your own. Who knows, it may be the start of a new Christmas tradition. Introduction to the after school gingerbread project. Day 1: List of ingredients and equipment. Day 2: Make and chill the dough. Day 3: Cut and bake the pieces. Day 4: Prepare Royal Icing + assemble the base. 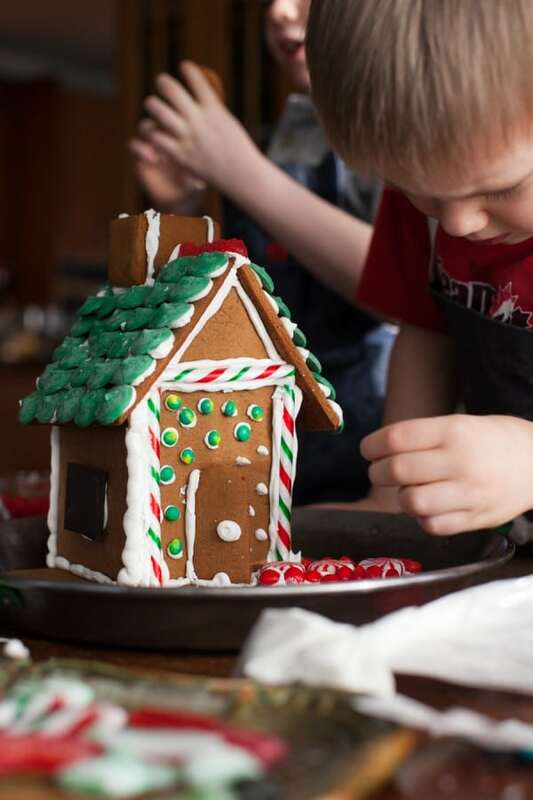 Share your gingerbread house creation with us! Send a photo via email: aimee@simplebites.net and I’ll publish your photo and name in an upcoming post. Aimée – what a great series. I am saving this and hope to maybe undertake it with one of my classes (not the Petits Chefs, but maybe my Grade 3s or 4s) next year. We can learn all about “la maison” as we do! Robin, they were – and are- super proud of it! It was a sweet project for sure. So cute!!! we just did these on Wednesday and the girls were so proud- I love this project! How fun! I can’t wait until Caleb is a little older so we can decorate gingerbread houses together! Beautiful job!!! It looks so lovely! I love the cinnamon stick wood pile! So creative! The first year my mom and I attempted to make a gingerbread house, I rolled the pieces too thick (especially the rooftop) and the royal icing was all wrong, lol, so needless to say it collapsed! 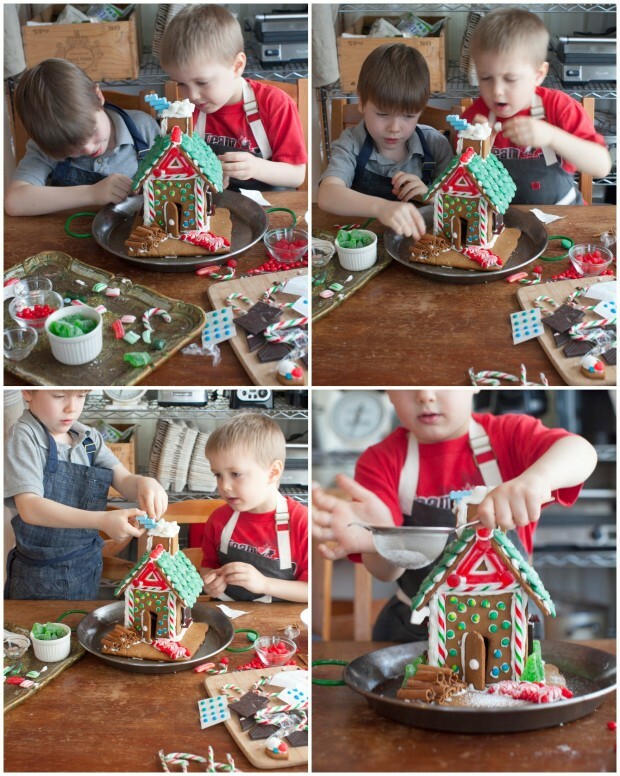 Then the next year we got better at it, and were more careful, and we learned to hold the walls upright/together with soup cans… Gingerbread houses are really great fun from start to finish (especially shopping for all the candy to decorate with). By the way, Mateo’s little cinnamon stick woodpile is super smart! Never thought about that! I loved this who week! I have been silently following love and loving every post. I have to make the time to do this with my little sister. She would LOVE it! Thanks for all the photos, recipes and tips!! So beautiful! Aimee, your little boys are so cheerful! And the house is magnificent. I’ve been following up this series with a great interest and enthusiasm, planing to re-create this experience next year with our little boy. While being on a Christmas market in Germany over the weekend, our 9 years old cook received a gift, which was a kit with home-made, pre-baked elements. So, all we would have to do is the decoration work and I look forward to it next weekend. Oh my gosh, absolutely adorable!! 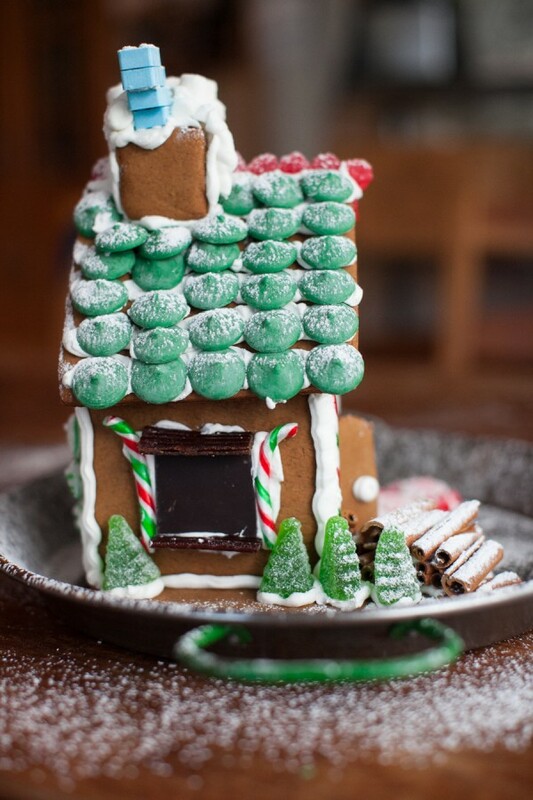 Seriously, the details, the perfect roof tiles, the dusting of icing sugar – I LOVE it all! Look at their sweet faces concentrating, too. Awwwww! Makes my heart melt, truly. Love this sooo much. They are serious artists at work. 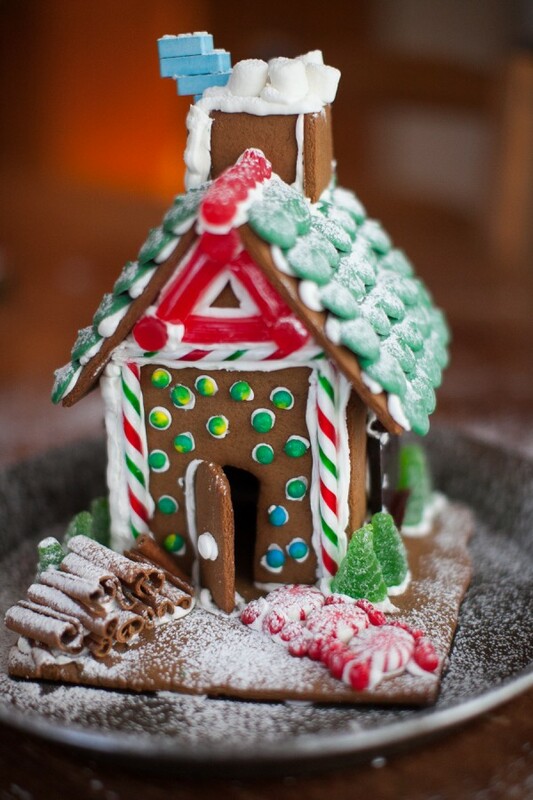 I hope you will add it to my gingerbread house tour linky. Hugs! Wow this looks so much better than mine… hahaha. That’s what happens when you rush. I’m definitely using this for inspiration next year!